I have this whole list of topics to pick from for this 31 days. They're even in an order of sorts! Yay for my organizational skills! I went into this organized. I have plans, research, guest bloggers, and most importantly excitement for this month!! But then today, ooooh today. Today was filled with struggles. Nothing big, nothing monumental, nothing life changing or earth shattering, just every day struggles, the kind that usually only come one at a time and instead came all at the same time, all day long. Misbehaving kids, planning for an out of town weekend, trying to pack and feeling bad about myself, and bickering with my spouse. And hours passed and I didn't write. My patience and grace ran thin and eventually I thought to myself "I cannot possibly write a blog about prayer right now, I'm in no position to be telling anyone anything about spiritual matters." The house is (semi) quiet now, and the kids are asleep (or at least the baby is, the boy is laying in bed plotting his next excuse to get out of bed), and I am in my bed. I sat down to write and to pray. And as I tried to pick a topic from my very impressive list I struggled. I felt like a fraud. And I thought "I just won't post anything today, no one will notice, I have nothing to say anyway, today just feels like one attack after another and I give in, I'm beat." And then I realized, even if I have nothing good to say I still have one undeniable truth to share: Satan doesn't want us to pray. Those moments that feel too hurried or clouded or shameful to pray in, those moments that make prayer feel like the last thing on the to-do list, those moments you want to just skip, those are an intentional attack. Yesterday I let Oswald Chambers do the speaking for me and we learned that prayer is the way to strengthen God's life in us. Why, oh why wouldn't Satan try to stop that? So today I have nothing to say except that, to remind myself (and you) that my prayer life (and yours) has a target on it, and to encourage all of us to be better guardians, and not fall for the tricks to keep us from those intimate moments with the Lord. Oh! P.S.! Some time soon I will be having a guest blogger!! 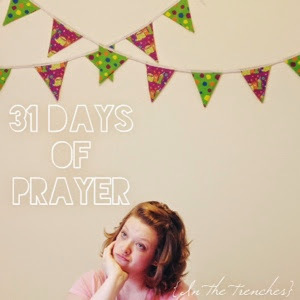 I have convinced my very wise, very incredible grandma to write something for my 31 Days of Prayer. She just emailed it to me and it's great! Keep your eye out for that because I promise you will be blessed by it!